Planning a project has never been easier. The free Project Portfolio Template has the tools and capacity to give you everything you need to plan and manage your project, whatever that might be. You’ll be given a table that lists the tasks of your project in a way you can share and collaborate with other people. You can even display the current status of your tasks in a color-coordinated system. 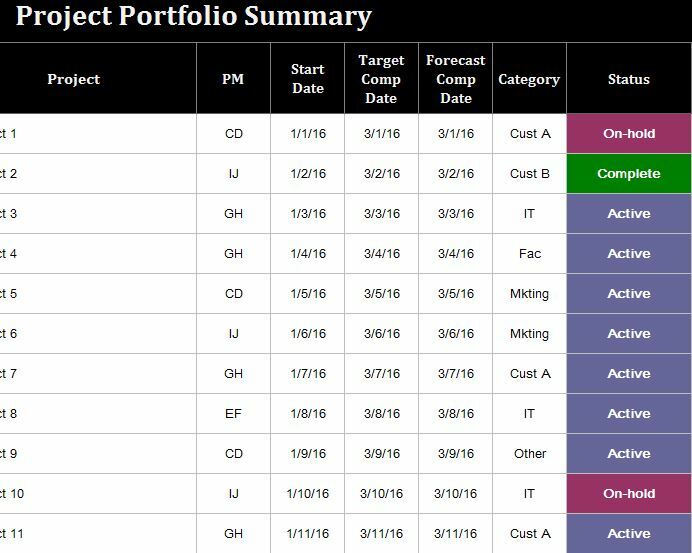 If you’re ready to manage a project with perfect clarity and accuracy, then you need to try the free Project Portfolio Template today. To download the template file to your computer, you’ll simply follow the link we’ve provided at the bottom of this page. When you open the document, you’ll see 3 tabs at the bottom. Start in the “Entries” tab. Each category you need to enter information for will be listed in bold and indented. Go through and change the example data to fit your own project. Now go to the “Stats” page to start entering the details of your project. You can enter items like the name of your project managers, who’s assigned to what, and much more. When you finish, go to the “Summary” page for an overview of all this information. You’ll start by entering the task name, the project manager, the start and end dates, the target completion and expected completion dates, a category, and the current status of the task. If you go back to the “Entries” tab, you can see what the Project Portfolio items mean, such as Time, Scope, Cost, etc. Use this data to fill out these tables for your projects and tasks. If you, or a member of your team, have any final comments to make, simply enter that in the “Comments” section of the template.